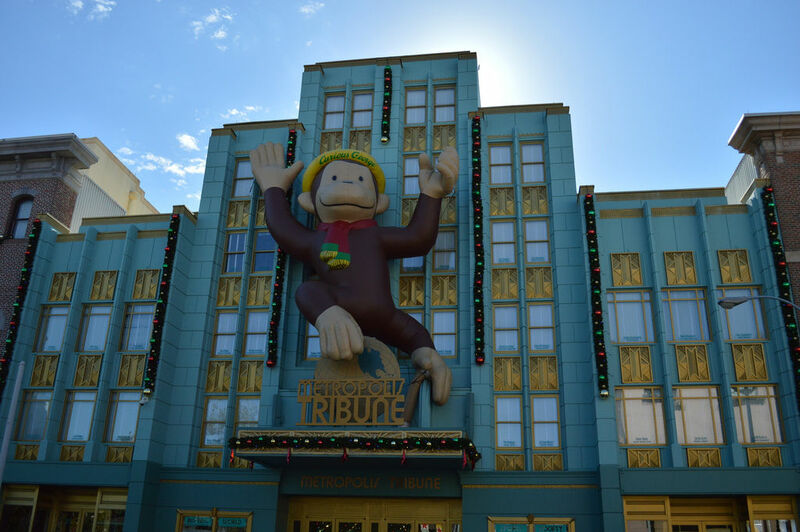 This week Universal NOW‘s Brandon Glover and I went to the Universal Orlando Resort to experience Grinchmas and see the latest construction work at CityWalk and Universal Studios Florida. 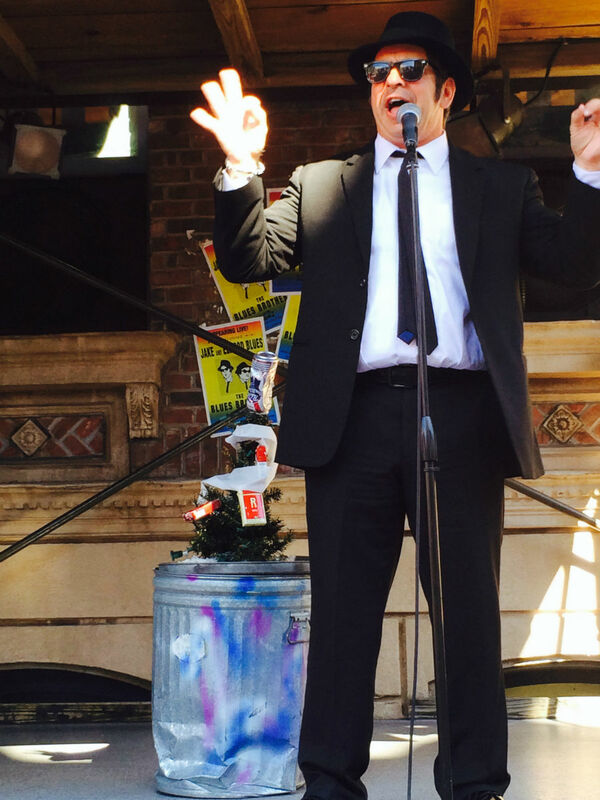 We also wanted to see the Blues Brothers Holiday Show. We had heard a lot of great things about this show and wanted to see if it lived up to the hype. Spoiler Alert: it does, but more on that later. Lastly, we were determined to finally go into NBA City and check out the legendary Towering Cheesecake dessert. 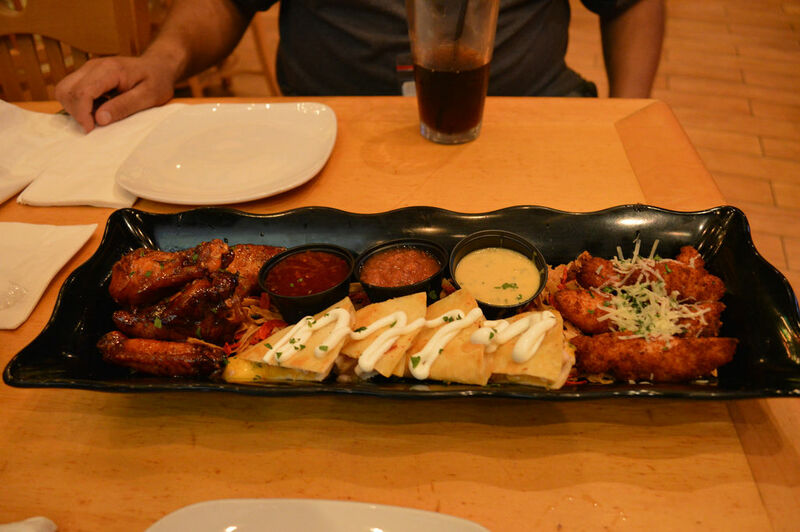 Our first stop was the upcoming Mexican restaurant Antojitos. Earlier this month, Morgan Crutchfield was at the Universal press event that detailed the upcoming dining venues including Antojitos. 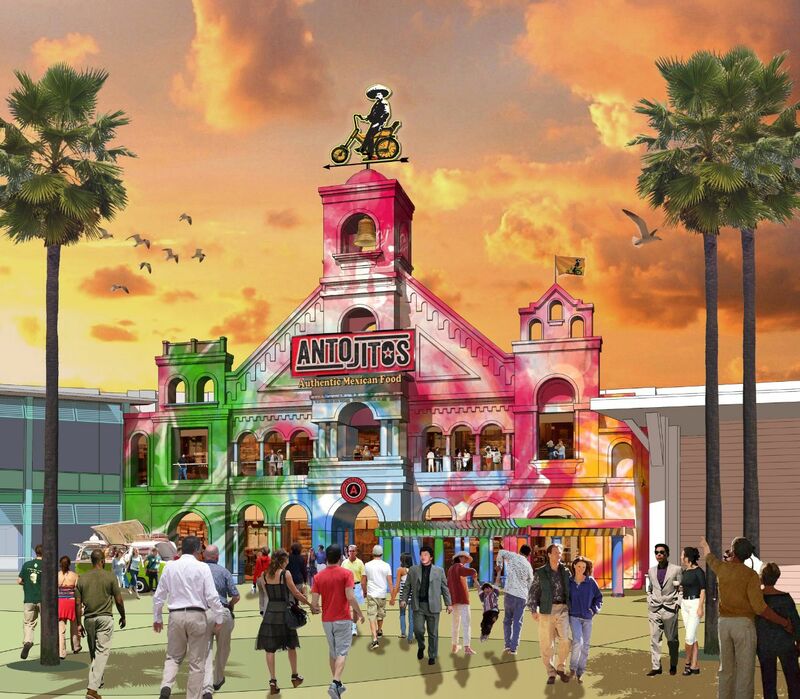 Her writeup of the event details all the upcoming restaurants in the massive CityWalk renovation, including concept art for each. The above picture was taken on a Friday and the one below was taken on Sunday. 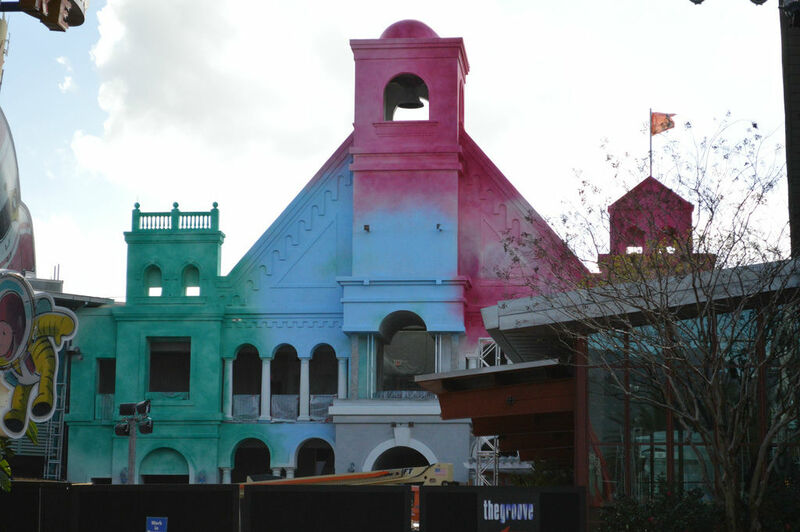 Universal is using a lot of color on the outside of this restaurant. I personally don’t like it. 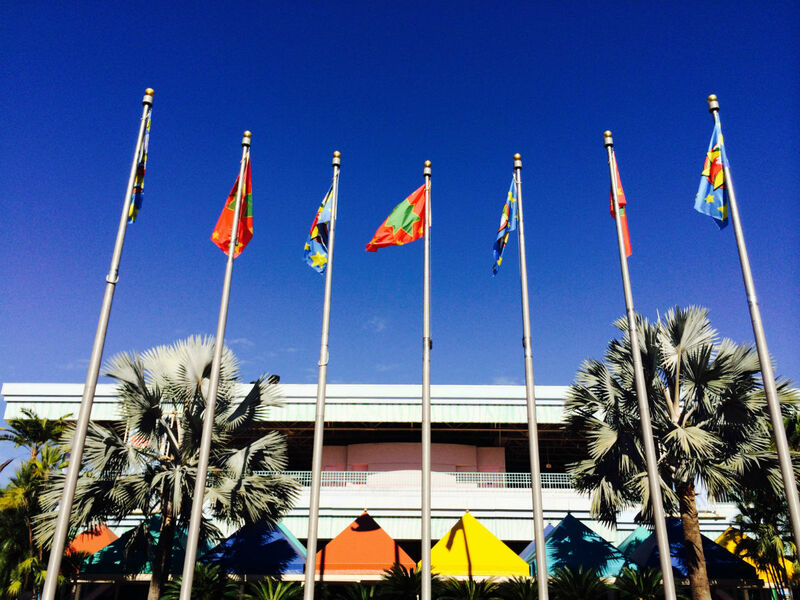 The overuse of color is perfect in Seuss Landing, but – to me – just seems out of place in CityWalk. I think the front of this restaurant looks gorgeous and all the wacky colors just take away from it. Maybe I’m alone on the island on that one though. I am looking forward to trying the restaurant out as I’m a huge fan of freshly made guacamole and quality Mexican food. 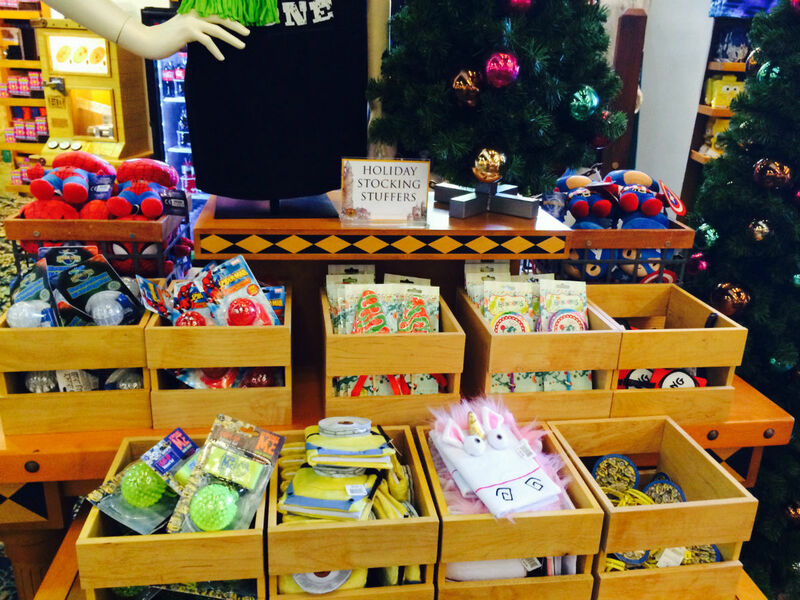 There were a lot of holiday themed merchandise available in both parks. 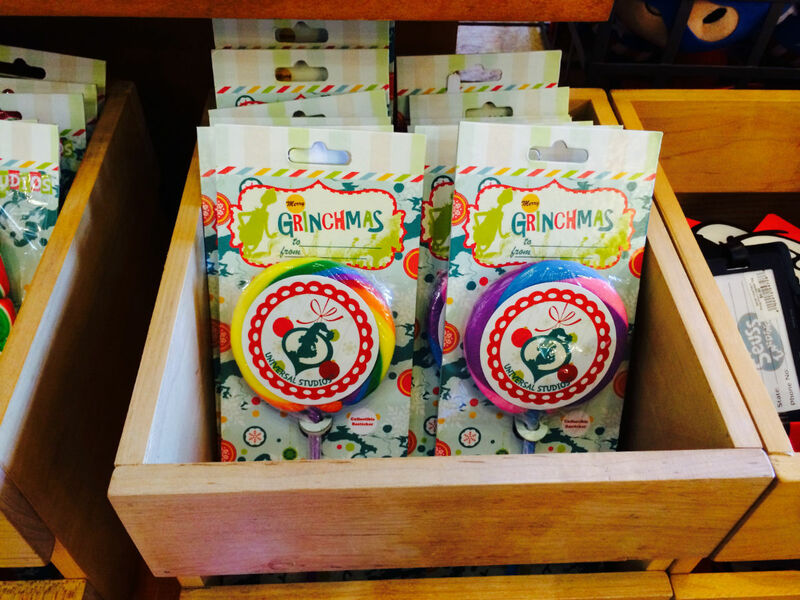 IOA even had this “stocking stuffer”section. Most of the times were things you could get all year long, but they did have exclusive lollipops, including one for Grinchmas. 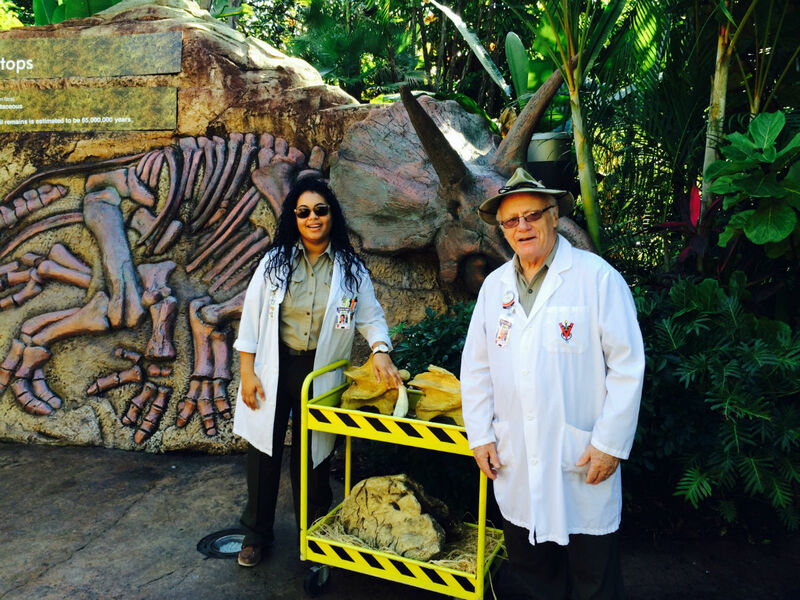 These scientists inside Jurassic Park are occasionally brought out when the crowds get really heavy. 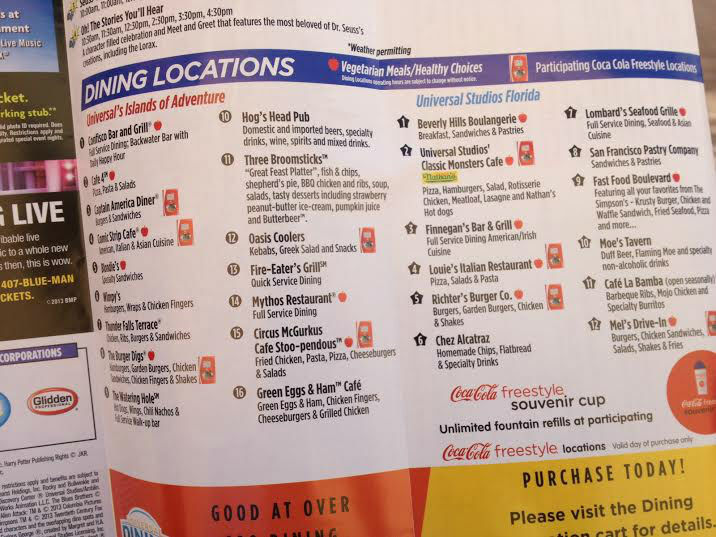 Brandon and I have working for a while on an in-depth study to determine which are the top six burgers at the Universal Orlando Resort. 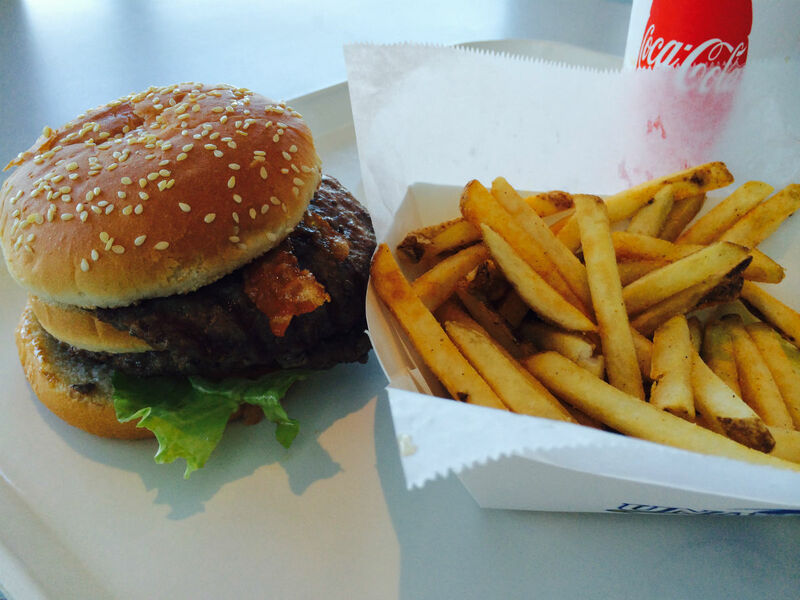 For this visit we stopped by Captain America Diner and tried their double burger. Two burgers, three buns, lettuce, and tomato and fries for $9.89. Bacon was an extra $0.75. Cheeseburger is the same price. The burger was good for a theme park burger, but nowhere near the class of some of the offerings at Fast Food Blvd. Right now the Kitchen burger is still holding the top spot in our list, but we’re looking forward to trying Margarittaville’s Cheeseburger in Paradise and the Hard Rock Cafe’s Legendary burger. One thing to note is that the Captain America Diner should be called The Avengers Diner. The theming inside the restaurant is filled with Avengers artwork, with very little Captain America. It also has an INCREDIBLE view where you can sit and look out at the lagoon. 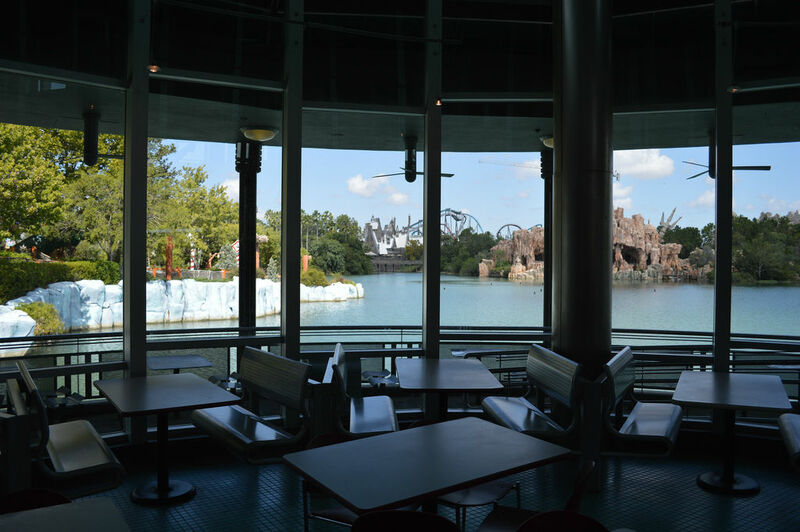 One of the best views of any restaurant in either park. 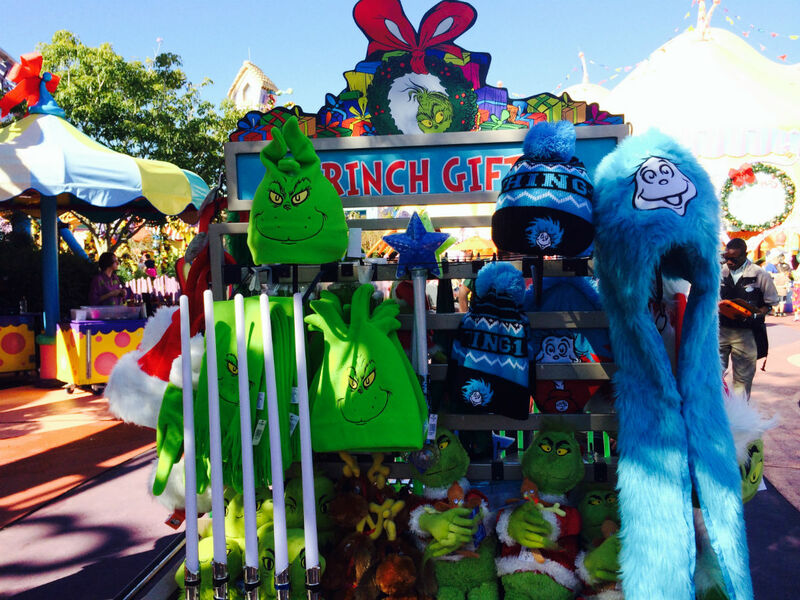 Over in Seuss Landing, their were carts selling Grinch items. After leaving IOA we took the side entrance to USF, one which most people don’t know about. 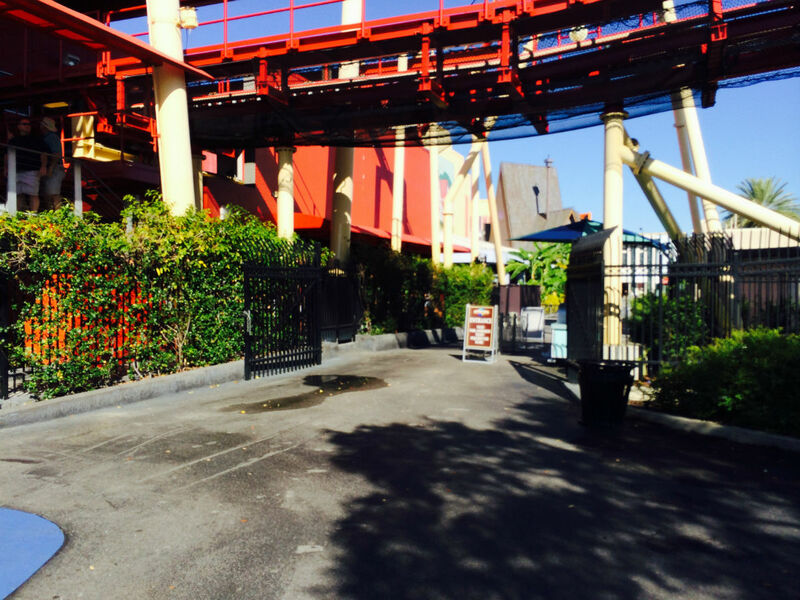 If you walk up to the Blue Man Group area, its right next to that and underneath Rip Ride Rockit. I have never seen a line here, but it opens up after park opening. On this day it opened up at 10:45AM. Pretty much everything was busy. I’ve never seen the line for the Shrek/Donkey meet n’ greet this long before. I do consider it well worth the wait and it made the list of one of the top six Photo Connect experiences. Donkey is worth going out of your way to see. 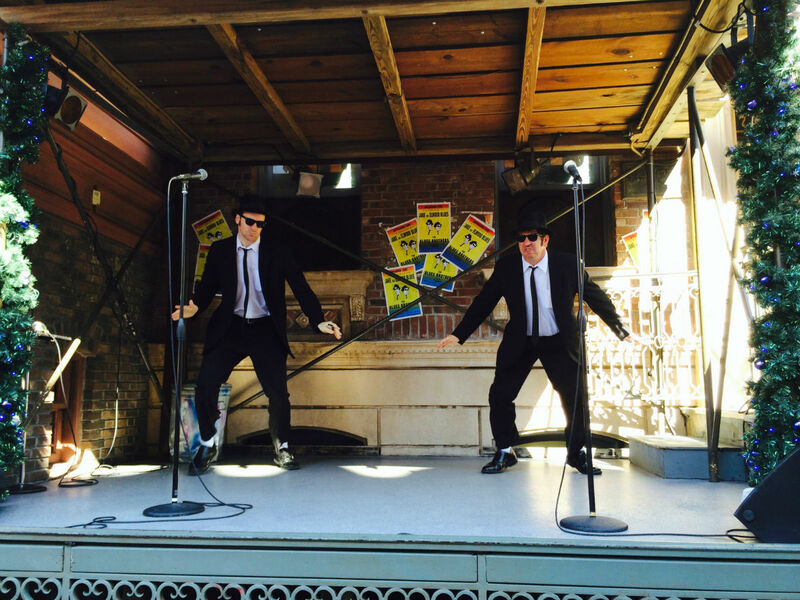 We went straight to the Blues Brothers Holiday Show, which is held on Delancey Street (in between Transformers: The Ride 3-D and Revenge of the Mummy.) I’m not a big fan at all of the Blues Brothers and have walked by their regular show countless times, never stopping for more than a few seconds. To quote Austin Powers, “it’s not my bag, baby.” However, I had heard great things about their Christmas show so we decided to check out the set. We were blown away by the show. Just a tremendous experience and one of my all time favorite live shows in either park. I wrote more about the show in a recent article on the holiday festivities at Universal, but suffice to say this show is now on my Must Do list every year from this point on. The guy playing the Elwood character was particularly good but everyone involved did a great job. What I enjoyed maybe most of all, and this is something you would never see at Disney and brought back memories of the great Bill and Ted’s show during Halloween Horror Nights, was when Jake Blues created his own Christmas tree using cigarette packs as ornaments, toilet paper as garland, and a Pabst Blue Ribbon beer can as a tree topper. This was fantastic. 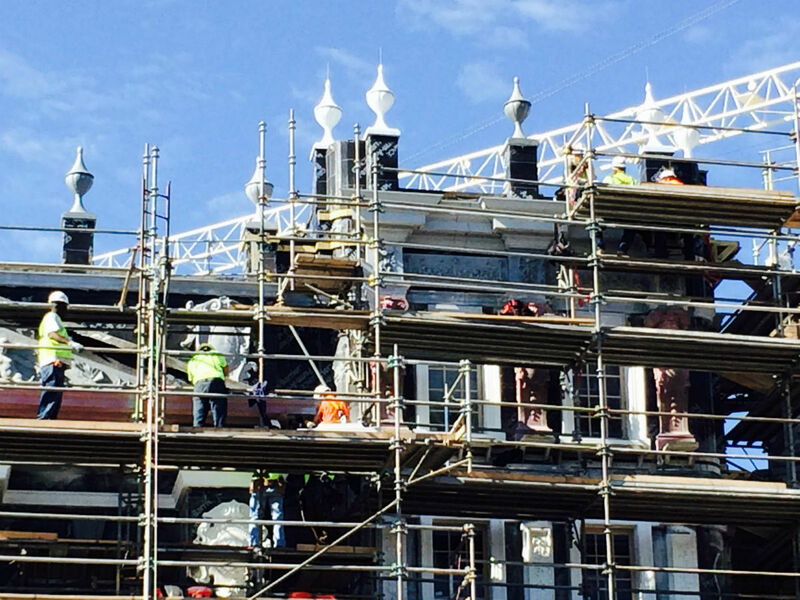 Seth Kuberskey is doing a great job with his PotterWatch articles (including the latest which details the amazing Gringott’s bank vault key that Universal sent to selected members of the media) and I find myself blown away every time I pass by the Diagon Alley construction area. The amount of detail just on the London waterfront facade buildings is amazing. The picture below does not do justice to the intricate work on display. You have to see it to believe it. 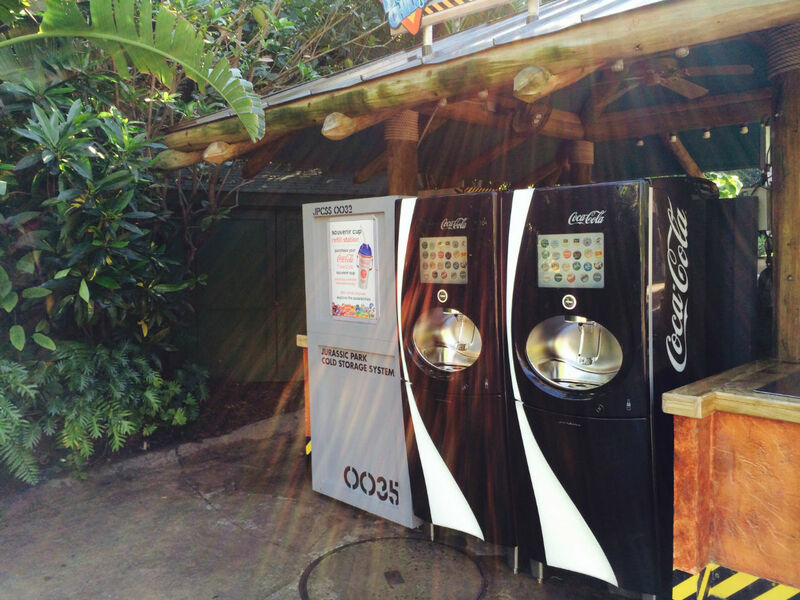 When Disney announced Avatar would be coming to Animal Kingdom in September of 2011, this area was operating the Jaws attraction and would continue to do so for another three months. 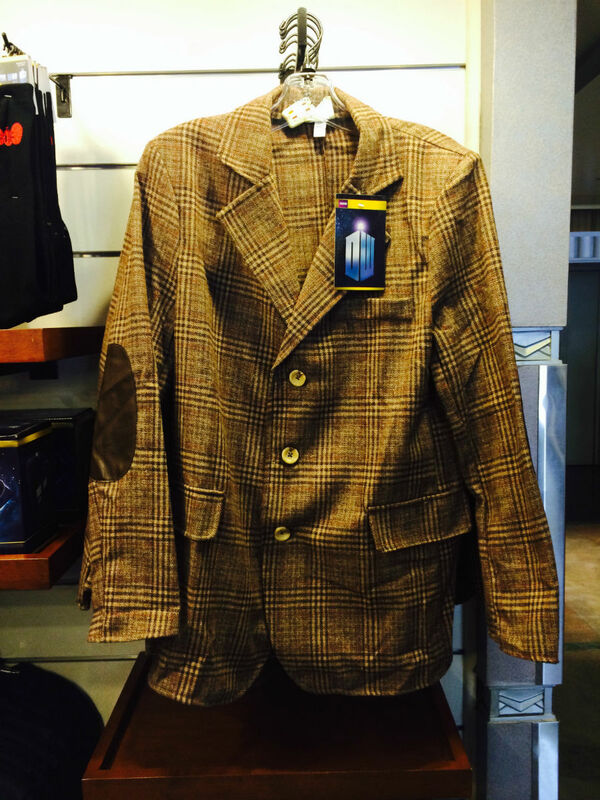 This Dr. Who jacket was for sale in the T-2 gift shop (one of the most underrated gift shops in any theme park). Price was only $59.95. 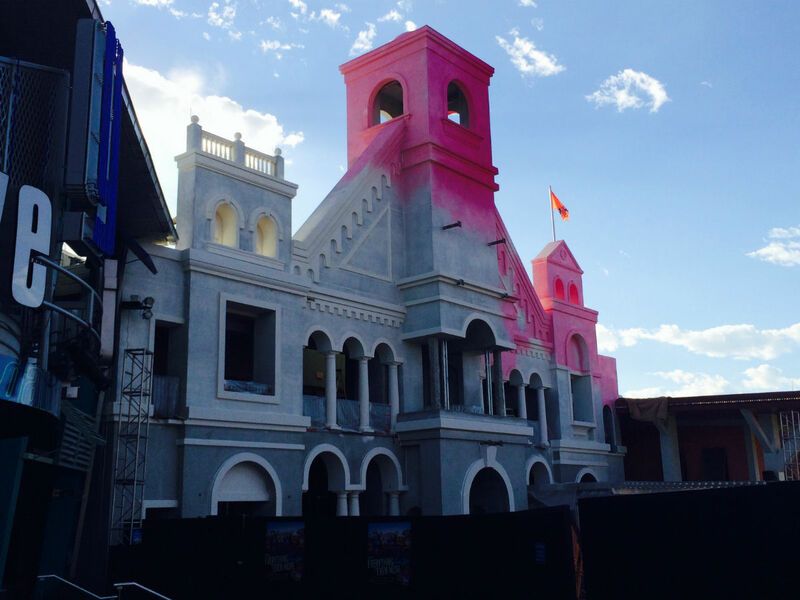 Construction is done in front of Animal Actors on Location. One set of flag poles have been removed and the others have new flags on them. The new flags alternate between Woody Woodpecker and what looks to be the People’s Republic of China. Sounds about right. 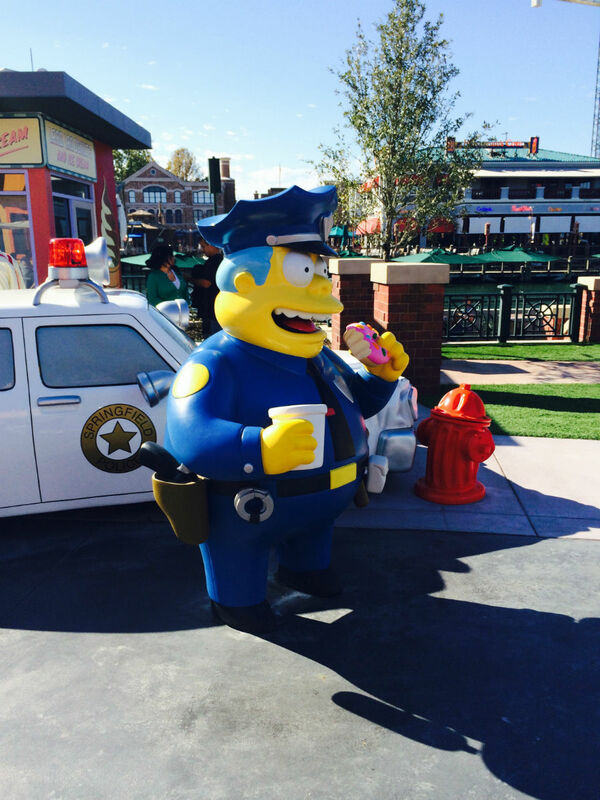 Chief Wiggum was back to his donut eating ways in Springfield USA after being gone for a little while. The amount of decorations throughout USF is pretty amazing, especially the larger than life balloons. As good as the decorations are, the Macy’s Holiday Parade is even better. 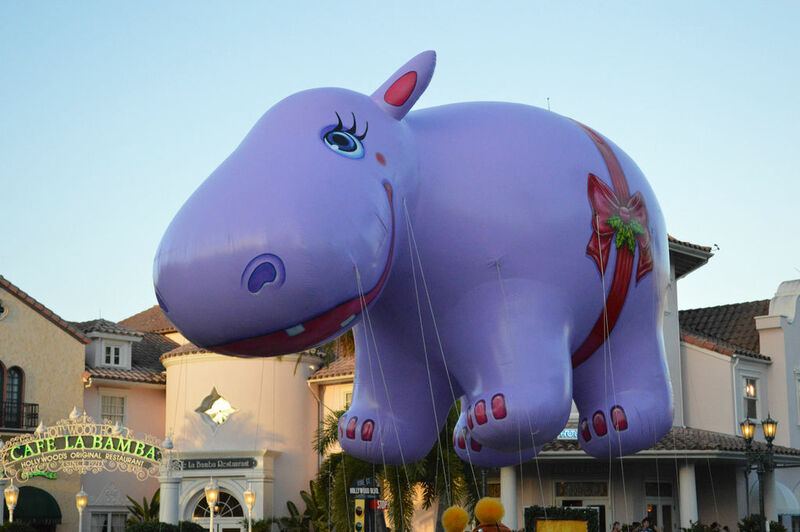 Happy Hippo appeared in this year’s Macy’s Thanksgiving Day parade in NYC before coming do to Universal. We closed out our day going to NBA City. As a person who is more than a little fond of outrageous foods at Universal, I was intrigued when I heard they had brought back the Towering Cheesecake to their menu. 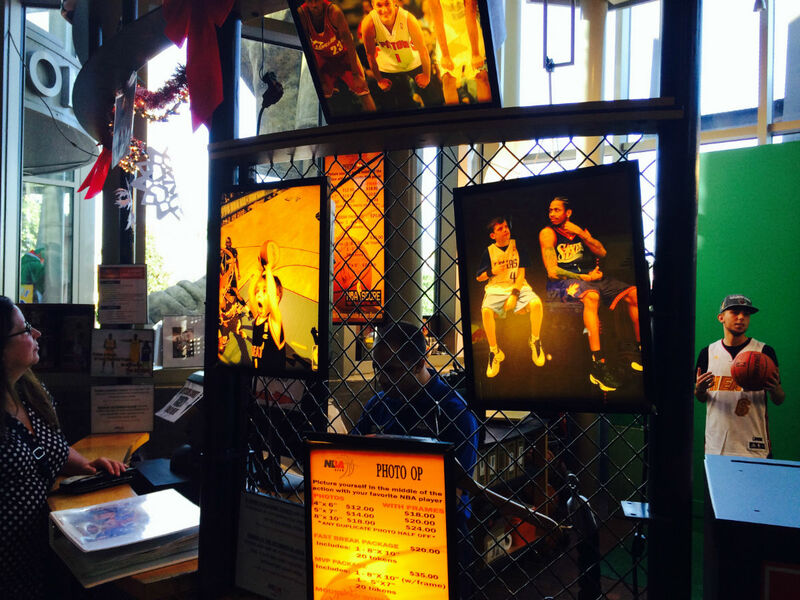 Now after having gone, I have to say NBA City moved way up my restaurant depth chart. The menu had a lot of interesting selections, there are TVs all over the place (including small ones in some of the booths), the game room was a lot of fun, and they had on of the best “photo” areas I’ve seen in any restaurant. But first, the main event. The Towering Cheesecake. Here’s the description: A traditional favorite with a twist. 4 towers of cheesecake lightly fried and rolled in cinnamon sugar. 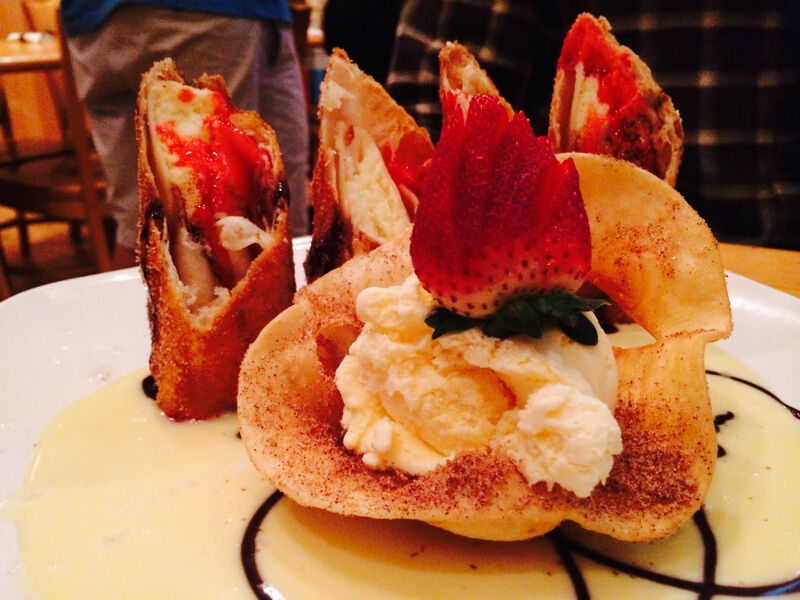 Accompanied by ice cream in a cinnamon tortilla basket on a plate of creme anglaise. There is a green screen area where you can get your photo taken and have it put onto a variety of pictures. My favorite by far is the kid dunking. You can also have two kids in the picture (or two adults) and have one kid dunking on the other. It’s hilarious! Definitely the most surreal photo op I’ve seen in a while and much more original than the “place your face on a magazine cover” that you see in the parks. That’s it for this trip. See you soon on our next adventure through the Universal Orlando Resort. If you like what you read you may also enjoy The Magic, The Memories, and Merch! 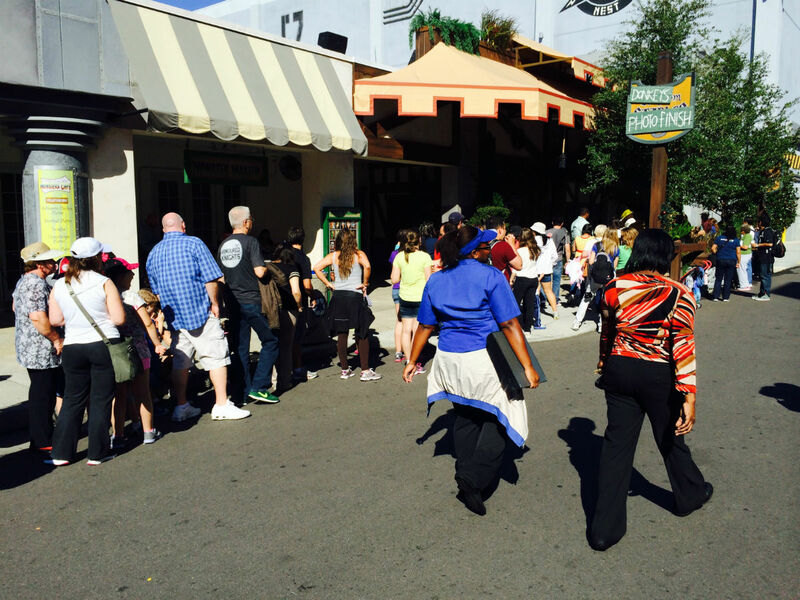 photo reports of the Disney Outlet Stores or – for your listening pleasure – the Pardon the Pixie Dust podcast. Subscribe to our Universal Orlando Crowd Calendar to get the best Universal Orlando wait-time data and touring plans, and check back soon for the next update! I enjoyed seeing the updates at Universal Orlando!